Since June is National Fresh Fruit and Vegetables Month, it’s the perfect time to focus on eating better. We have found the easiest way to incorporate more vegetables and fruit into your diet is to try new recipes. If you are looking for some new recipes, the Wild Oats Pinterest Boards are a great place to start. The Spring and Summer Recipes Board is full of delicious possibilities. And Smoothies are the perfect way to get lots of fruit and vegetables packed into a single drink. One of the best things about Summer is all the fresh vegetables and fruits, especially if they are grilled. Although grilling vegetables seems pretty simple, sometimes it can be tricky. Whether you grow your own, hit up the Farmer’s Market or make a trip to the grocery store, there is no shortage of great vegetables that are perfect for grilling. We have grilled a variety of vegetables including zucchini, tri-colored peppers, mushrooms, cherry tomatoes and onions. Grilling vegetables can be done a number of ways, and we have found a few tricks that will make your grilling super easy and create delicious results every time. To add a splash of flavor we like to use Wild Oats Marketplace Organic Balsamic Vinaigrette Dressing. Add the dressing to a spray bottle to make it easier to spritz the vegetables while you are grilling them. We have also found that adding the same vegetables on the skewers and not mixing them up, makes grilling them easier. Vegetables vary the amount of time it takes to cook. So having them separated on their own skewers allows you to grill them to perfection. Give the vegetable kabobs a good spritz with the dressing several times while you are grilling them, and finish them with one final spritz prior to removing them from the grill. And one last tip for grilling the perfect Summer vegetables – when you cut the onion, first peel the onion whole, then cut it into half and then each half into quarters making sure to leave the root and shoot ends on and in tact, that way when you are preparing and grilling the onions they won’t fall apart. Grilling fruits is also really easy and adds a lot of flavor to the dish you are preparing. By grilling fruit you can concentrate the flavors of the fruit by reducing the water in the fruit and caramelizing the natural sugars. Hard fruits like apples, pears, pineapples and lemons are the easiest to grill since they hold their shape. 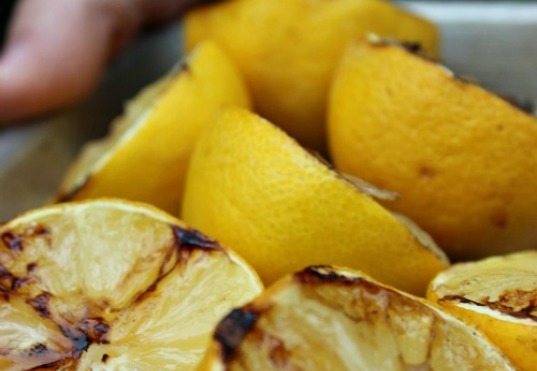 We grilled lemons and then made Lemonade with them and it was truly the best I have ever had. When we grill pineapple, we like to cut it into thick slices, and brush it with a little honey. It grills to a sweet and juicy perfection!